» Aerial sightseeing gone awry! As someone new to model submarines, I am building the Arkmodel German V11C, I thought I would start off with an easy (I asume) question. Can the aerial for a 72 Mhz receiver be run outside of the water tight compartment. This would give the aerial a straighter run and keep it away from other metal components. not a problem just remember to seal the end to stop water getting in. i got them running both inside and out. antoak wrote: As someone new to model submarines, I am building the Arkmodel German V11C, I thought I would start off with an easy (I asume) question. Can the aerial for a 72 Mhz receiver be run outside of the water tight compartment. This would give the aerial a straighter run and keep it away from other metal components. Yes. For the reasons you stated. But it's a good idea to isolate the antenna in the wet from the dry insides of the WTC. 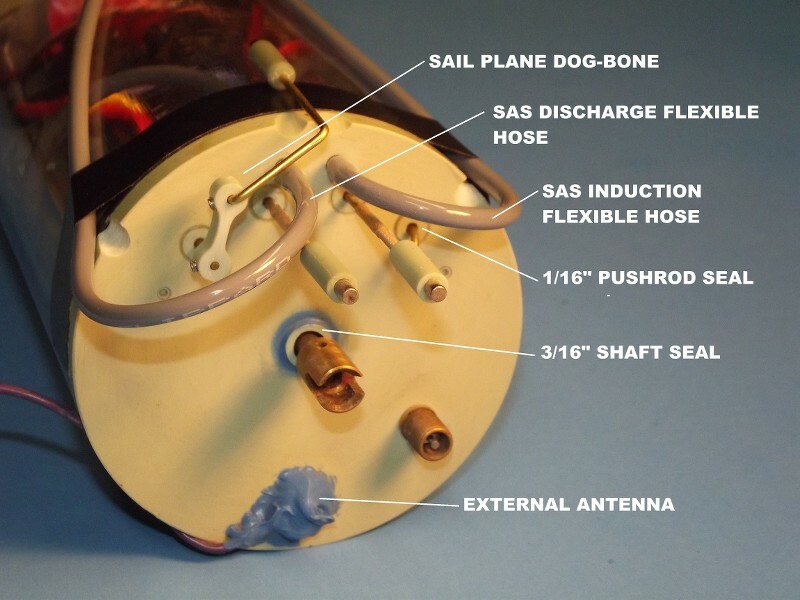 This is done by providing a conducting interface between the receiver and external antenna segments. That is done with a stud screwed through the after 'motor-bulkhead'. 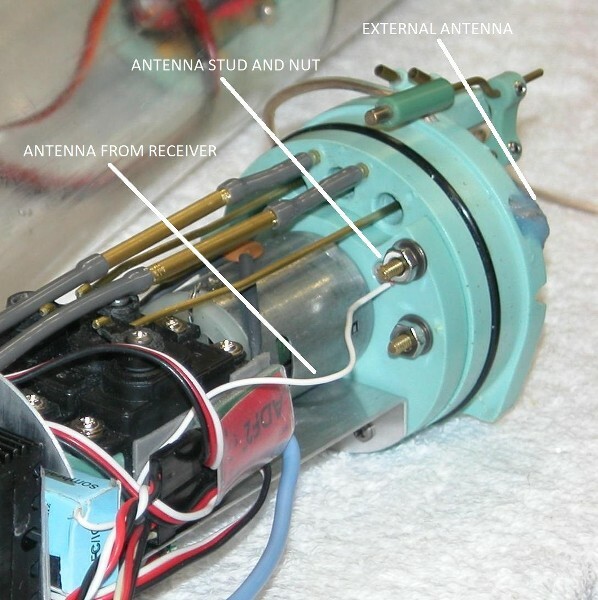 A nut at either end of the stud completes the connection between receiver and external antenna. You don't want to simply run the antenna between the receiver and the wet without a blocking interface between the dry and wet side of the antenna. Eventually water will get past the insulation and wick its way onto the receiver PCB, killing the device. Sounds impossible, but I've seen it happen. The unlucky guy (well, maybe not … he did get his boat back), during the post accident investigation, pulled the case off the receiver and everything inside was wet. Water, over a five year period, found its way! To isolate the bare antenna wire from the wet side, I smear RTV silicon rubber over the stud, nut, and bare antenna wire sandwiched between nut and washer. Note that I provide an antenna strain-relief by drilling a hole through the motor-bulkhead flange and reeving the antenna through it. Accidental pulling on the antenna wire won't lift it off the RTV insulation. Thanks for replies. Very useful information.